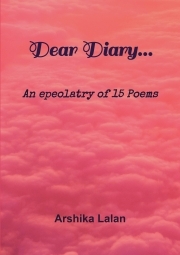 "Dear Diary..." is a collection of 15 poems written by Arshika Lalan. Born in Bhopal in the year of 1999, Arshika is currently pursuing her undergraduate education at BITS Pilani, Goa Campus. Her passion for writing began as early as the fourth grade, when she wrote her first short story , and continued all the way to her first year of college. She has written many unpublished stories and poems in her school life, and has dabbled in many genres. She likes to focus on the emotional development of the characters in her story, and give them a challenge or psychological obstacle to overcome during the course of her story. "Dear Diary..." is a myriad of human emotions , and every poem in this book is an attempt to convey the emotion attached with typical problems.